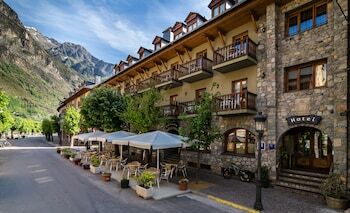 With a stay at Hotel Ciria in Benasque, you'll be within a 5-minute walk of Benasque Valley and Palacio de los Condes de Ribagorza. Featured amenities include complimentary newspapers in the lobby, dry cleaning/laundry services, and a 24-hour front desk. Free self parking is available onsite. Located in Yaiza, Villa Edenita A in Uga for 8 persons is within a 15-minute drive of La Antigua Escuela de Yaiza Art Center and Quemada Beach. When you stay at Pension Casa Blanca in Arona, you'll be near the beach, just steps from Los Cristianos Beach and 7 minutes by foot from Las Vistas Beach. A stay at Villa y Corte places you in the heart of Ampudia, a 2-minute drive from Ampudia Castle and 8 minutes from Church of Villerias Campos. With a stay at The Element in Cambrils, you'll be on the waterfront and convenient to Esquirol Beach and Llevant Beach.